Imagine the world as being asleep, or you will go back to sleep with it. What awakens you? When should you get involved? 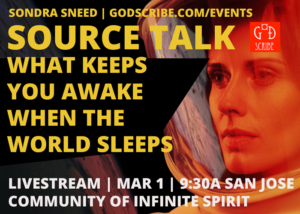 This Source Talk will not just alarm, it will provide activities to stay awake until the day you leave the planet. GET TICKET on Calendly – no ticket fees! I open my mouth to speak and it’s not me. Are you new to my Livestream Source Talks? Here’s what happens. I perform before an audience by allowing Source intelligence to speak through me. I don’t control the content, it controls me! You will be informed sometime before the program, what link to click to tune-in. It depends on my access to wifi where I am as to the Livestream location on the internet. Then, within two weeks of the broadcast, sometimes within a few days, I will send the link so you can watch it again, or for the first time. Also, I send the mp3 to download for later listening. Because everytime you hear a Source Talk, there’s something you didn’t catch the first time and it’s like a whole new talk. Don’t forget to buy your ticket. Here are some excerpts of previous Source talks this link. Hi All! I’m using Calendly now, to avoid event fees. Eventbrite not only wants to charge ticket fees but then adds another $2 for every ticket. So essentially they get $4 for every $10 ticket. Forget it! So we’ll use the event setting with Calendly method for a while.